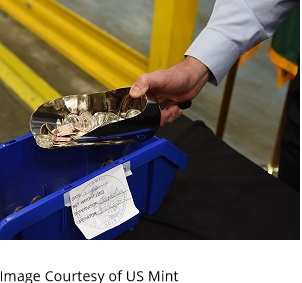 On April 2, 2019, the U.S. Mint announced that for the first time ever it has struck quarter dollars with W-mint marks for the West Point Mint and that the coins will only be available in general circulation. What’s more, only 2 million of each of the five 2019 quarters will be struck, a low number for a coin of this type, which has had an upwards of hundreds of millions struck in recent years. The first of these coins have already been produced and shipped by the Federal Reserve to banks and other financial institutions. 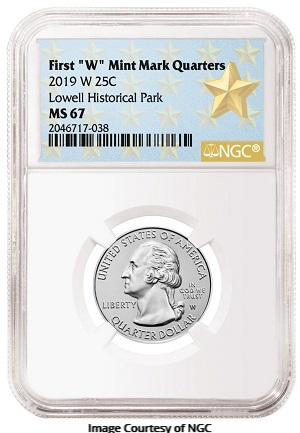 They include both 2019-W Lowell National Historical Park and 2019-W American Memorial Park quarters, which should begin appearing in circulation within four to six weeks, according to the Mint. Those coins were randomly mixed into bags of quarters struck at the Philadelphia and Denver Mints and will not be available in any numismatic products or sold in bags and rolls as are the “P”, “D” and “S”-mint quarters. The other 2019-W quarter dollars to be released this year include the War in the Pacific National Historic Park, San Antonio Missions National Historic Park and Frank Church River of No Return Wilderness coins. Some collectors have compared the new “W” quarters to the “S”-mint quarters produced at the San Francisco Mint since 2012, but the latter coins are not released into circulation and are only sold at a premium by the U.S. Mint in bags and rolls. They also have substantially higher mintages. 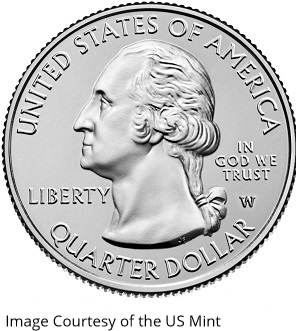 Quarter dollars were issued briefly at the West Point Mint from 1977 to 1979, but those coins did not have mint marks. National Coin Week is an initiative of the American Numismatic Association (ANA), and this year’s event is intended to pay homage to discovery and invention throughout history with a special focus on the 50th anniversary of the Apollo 11 moon landing. The event includes trivia challenges, a chance to design a coin for the year 2069 and other programs to increase interest in the hobby, especially those held by coin clubs around the country. David Ryder, the U.S. Mint Director, said: “We want to encourage Americans to consider coin collecting by making the W mint mark quarters only available in general circulation.” In addition, the issuing of coins with limited mintages that are also the first of their kind into circulation is being done just as coin dealers around the country are about to launch the Great American Coin Hunt, in which they will place some of their own rare coins into circulation by using them in cash transactions to help stimulate interest in coin collecting. The combination of those coins and the “W” quarters should have millions of collectors searching their change more closely than usual starting this month. Longtime coin collectors have long lamented the days when one could find coins worth more than their face value in change. Others have noted that being able to find such coins in change would be a great way to increase interest in the hobby. As the coins are mixed in with other quarters and not sold separately, it would be very time consuming and difficult for a dealer or collector to obtain a substantial number of these coins by purchasing boxes of quarters and going through them to find the “W”-coins. The level playing field for the coins addresses concerns some people have expressed about intentionally releasing a low-mintage coin into circulation. At the third annual U.S. Mint Numismatic Forum held last October, Director Ryder said he was planning an initiative of this type, but no specific details were made at the time. The West Point quarter program, like the special 2019-W Lincoln cents that are being added to 2019 U.S. Mint Proof sets as a special bonus, reflect the current Director’s strong commitment to promoting the hobby. The West Point quarter program should also help increase interest in collecting America the Beautiful quarters, which have not been as popular as the State quarter dollars before them were. As for their mintage, some people would argue that two million coins is not an especially low number, but it should be put in perspective as a circulating modern coin. Last year, for example, almost two billion quarters were struck. Not to mention the billions of circulating pennies issued most years. Plus, some of the coins will be in the hands of people who are not aware of the importance of the “W” mint mark and won’t even know they have them. The U.S. Mint first began issuing coins with mint marks in 1835. “P” and “D” coins are typically issued for circulation and are the most common mint marks. Coins struck at the West Point and San Francisco Mints are mainly produced for Proof, commemorative and/or bullion coinage. In the 19th century collectors did not pay much attention to mint marks, but in the 20th century collecting not only by date but also by mint mark became widely popular, largely because of the explosion of interest in collecting coins from circulation. Collecting coins by mint mark is today a major part of American numismatics. 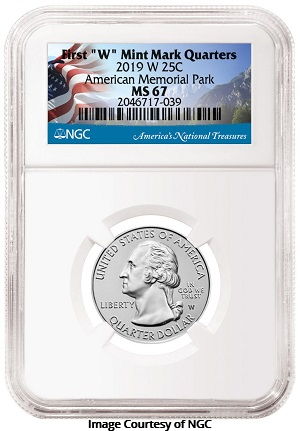 Numismatic Gauruntee Corporation (NGC) will be giving these W-Quarters a special designation to bring attention to their being a first ever release. 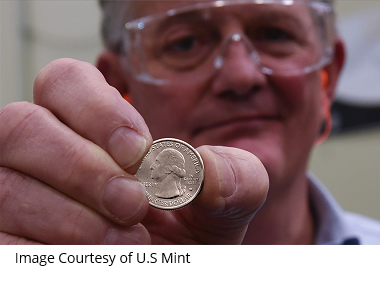 Each W-Quarter certified by NGC will receive the designation, "First "W" Mint Mark Quarters." NGC will be offering these submissions in a striking West Point Gold Star Label as well as their America's National Treasures Flag Label in addtition to Early Releases and First Releases designations.